Soup is one of the best secrets for feeling satisfied and well nourished while trimming calories from your day. That's because soup adds significant volume and weight to your meal without adding calories. This Mediterranean- inspired roasted tomato soup is my must-have to help balance out all of the inevitable heavy holiday eating. Roasting the tomatoes brings out their sweetness and concentrates the flavor- and I decided to try and turn up the flavor even more by roasting the rest of the veggies, too. The result? Divine.With an added boost of protein and fiber from the cannelini beans, this soup is perfect for adding more healing plant foods to your bowl. 1 15 oz. can cannelini beans, drained and rinsed. Place the onion, celery, carrots, garlic and rosemary on a baking sheet. Drizzle with olive oil and toss with salt and freshly cracked pepper. Place on top rack in oven. 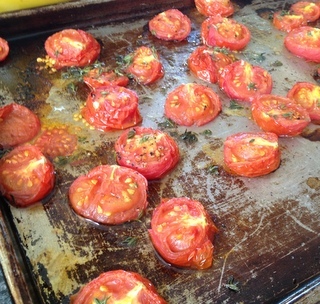 Place the tomatoes on a separate baking sheet. Top with thyme, olive oil, salt and pepper, and toss to combine. Place in oven on rack below carrot and onion mixture. Roast veggies for 30 minutes-or until tomatoes have some color on top, and until carrots are tender. Remove pans from oven and allow to cool slightly. Carefully pour contents of each pan into your blender or food processor, scraping up all the delicious bits on the bottom of the pans and putting them in as well. Blend until smooth (if you like a chunkier texture, only partially blend). Transfer soup into a large saucepan. Add the beans and stock and stir until smooth. Bring to a simmer, add the spinach, and cook another 2 minutes until spinach is wilted. If you like a thinner soup, add some more stock. Serve into bowls, top with a couple of tablespoons of fresh basil and serve immediately.